Authors and presenters are responsible for how medical research is interpreted and communicated. Often their work is the product of collaborations with other individuals (such as clinical investigators, biostatisticians, and professional medical writers) from around the world. Some or all of the people who contribute to this collaboration may be employees of research sponsors, contract research organisations, or medical communications agencies that may be funded by pharmaceutical, medical device, or biotechnology companies. The authors, collaborators, and organisations share responsibility for developing articles and presentations in a responsible and ethical manner. The good publication practice (GPP2) guidelines presented here make recommendations that will help individuals and organisations maintain ethical practices and comply with current requirements when they contribute to the communication of medical research sponsored by companies. These guidelines apply to peer reviewed journal articles and presentations at scientific congresses. The conduct and communication of medical research, including that sponsored by companies, continues to be criticised.1 2 3 4 5 Since 2003, when the original good publication practice guidelines were published,6 the environment in which medical research is reported has evolved. The Declaration of Helsinki, updated in 2008, places accuracy and completeness among the primary ethical obligations of individuals communicating medical research, and suggests that “reports of research not in accordance with [its] principles should not be accepted for publication.”7 Information about clinical trials, including results, is being made accessible in new ways driven by regulations and guidelines from around the world.8 9 10 11 12 13 14 15 Standards for the accurate publication and presentation of research have also evolved,16 and new or updated codes of practice have been developed (table 1⇓). The International Society for Medical Publication Professionals (www.ismpp.org) has been established and certifies the practice of individuals developing articles and presentations sponsored by companies. These guidelines were written in light of these developments. The International Society for Medical Publication Professionals invited members with over 10 years of experience in biomedical publishing to develop these guidelines (figure ⇓). The 14 members named as contributors to this article responded to the invitation and formed the steering committee. The steering committee reviewed the original guidelines,6 discussed items to be included in the revised guidelines (GPP2), and wrote the draft guidelines. The steering committee recruited an international consultation panel by direct invitation and multiple open requests for volunteers. The draft guidelines were circulated to the 193 people who agreed to be part of the consultation panel for comment. The consultation process was conducted in confidence (table 2⇓). The steering committee member’s interpretation of the importance of the comments. Ranked comments submitted by steering committee members were combined into a composite rank, which was used to create the final guidelines. Provide authors with copies of the sponsor’s publication policy. We recommend that written agreements for articles and presentations from research studies are made at the earliest opportunity—for example, when the protocol is finalised. Written agreements for other articles and presentations (for example, meta-analyses, sub-analyses, review articles) should be made before the authors begin work. Written agreements must respect the institutional policies of authors, investigators, and other contributors, as well as those of the sponsor. Individuals must not be asked to violate the policies of their institutions. It may be appropriate for companies to reimburse reasonable out of pocket expenses (for example, travel expenses) incurred by contributors or pay for specialised services such as statistical analysis. Details of this reimbursement must be disclosed. We recommend that no honorariums are paid for authorship of peer reviewed articles or presentations. Authors and contributors agree to their roles in the development of an article or presentation before writing begins. Recognised criteria should be used to determine which of the contributors to an article or presentation should be identified as authors. We recommend using the criteria for authorship described in the International Committee of Medical Journal Editors (ICMJE) uniform requirements (box 1).8 Guidance regarding authorship is also available from the World Association of Medical Editors17 and the Council of Science Editors.18 Criteria used to define authorship may vary among journals and congresses, and we recommend following individual journal and congress requirements when these differ from ICMJE criteria. ICMJE criteria allow assignment of authorship to individuals who have contributed to the analysis and interpretation of a study but who may not have contributed to its conception and design. In these instances, or if authors differ from initial plans, particular care should be taken to attribute authorship and to acknowledge contributions appropriately. We recommend that authorship criteria are applied consistently to all contributors to an article or presentation, including investigators, sponsor employees, and individuals contracted by the sponsor. All authors listed on an article or presentation must fulfil authorship criteria, and all those who fulfil the criteria must be listed as authors. All authors should agree on the order in which they appear in an article or presentation (if possible before writing begins) and should agree on any changes in authorship (for example, to ensure authorship reflects actual contributions made) before submission. Before writing begins one author (a lead author, who may also be guarantor) should take the lead for writing and managing each publication or presentation. One author (identified as guarantor) should take overall responsibility for the integrity of a study and its report. Interpretation of authorship criteria varies, and using a contributorship model to describe who did what helps to remove ambiguity.8 19 20 21 We support this approach and recommend that clear, concise descriptions of the role of each contributor during preparation of the article or presentation (including but not limited to the authors) are made in an acknowledgment within the article or presentation. Individual contributions to an article or presentation that should be acknowledged include study conception and design, conceiving the idea for an article, conducting or managing a study, collecting data, performing statistical analysis, interpreting data, analysing published literature, drafting a manuscript, critically reviewing a manuscript, and approving a manuscript. Permission should be obtained from each individual acknowledged. When journal or congress submission requirements do not allow inclusion of this information within the article or presentation, we recommend that it is included in a letter that accompanies the submission. Professional medical writers must be directed by the lead author from the earliest possible stage (for example, when the outline is written), and all authors must be aware of the medical writer’s involvement. The medical writer should remain in frequent contact with the authors throughout development of the article or presentation. The authors must critically review and comment on the outline and drafts, approve the final version of the article or presentation before it is submitted to the journal or congress, approve changes made during the peer review process, and approve the final version before it is published or accepted for presentation. Authors may delegate to the medical writer (or to an assistant) the administrative tasks associated with submitting the article or presentation to a journal or congress. Professional medical writers, depending on the contributions they make, may qualify for authorship. For example, if a medical writer contributed extensive literature searches and summarised the literature discovered, and by doing so helped define the scope of a review article, and if he or she is willing to “take public responsibility for relevant portions of the content”8 then he or she may be in a position to meet the remaining ICMJE criteria for authorship. We recommend that authors disclose financial relationships (for example, any financial relationships or obligation to the research sponsor or other companies, including contractual relations or consultancy fees for scientific, government, or legal services, or equity in the company) and non-financial relationships (for example, personal relationships, including those of immediate family members, and participation in litigation) that could inappropriately influence or seem to influence professional judgment. We recommend that these disclosures are made in all articles submitted for publication in peer reviewed journals, as well as in abstracts and posters submitted to congresses at the time of submission, if space requirements allow, and that they are included in oral presentations and posters at the time of presentation, regardless of whether disclosure is requested by the journal or congress. There is no universal standard applied by journals and congresses for disclosure of potential conflicts of interest. Until discussions about how to address conflicts of interest are resolved,25 27 28 29 we recommend authors favour greater, rather than lesser, disclosure. A primary article is the first full report of a study. We recommend that all articles and presentations include statements to indicate whether they are the primary article or first presentation from a study, including for randomised clinical trials; epidemiological, observational, and descriptive studies; non-clinical outcomes research studies; and health economics studies. Authors preparing secondary articles and presentations (including those that describe exploratory secondary analyses, national or single centre data taken from international or multicentre studies, and alternative analyses or pooled analyses of already published data) must avoid duplicate publication. All post-hoc and exploratory analyses must be clearly identified as such. Authorship of secondary articles and presentations may differ from that of primary articles and presentations from the same study, depending on, for example, the topic of the article or presentation. We recommend that one or more authors of the primary article from a study contribute to the secondary articles and presentations from the same study. The article is clearly presented as an analysis derived from the previously published primary results or is a translation, is not presented as reporting the primary results, and respects copyright law. Congress guidelines should be followed for presentations that describe study results that have been presented at an earlier congress. We recommend that, at the time of submission, authors disclose whether the same results will have already been presented at the time of the congress. With approval from the authors of the primary article, research submitted for presentation at national or local meetings may include authors who do not appear on the primary article (for example, to enable accurate presentation in the appropriate language). Has anyone (particularly a company or public relations agency) prompted or paid you to write this article? Would/did a professional writer contribute to the article, and to what extent? Would the BMJ article be original, or would it be similar to articles submitted or published elsewhere? Studies with related findings should be cited, especially when previous results conflict with the results being reported. Publication plans can help study sponsors ensure that clinical trial results are communicated by presentation or publication to the scientific and medical community in an effective and timely manner. They can also enable sponsors to identify the timelines and resources necessary to meet their obligations for reporting and publishing clinical trial results. Authors retain responsibility for decisions about articles and presentations from individual studies, which may be described in a publication plan. Authors may present clinical study results at congresses before publication in a peer reviewed journal. Authors and other parties with access to study results should avoid further and more detailed public reporting before publication in a peer reviewed journal, unless the circumstances are exceptional. Authors should not submit their work for consideration by more than one peer reviewed journal at any one time. All parties should respect embargoes set by journals, congresses, and other media. For example, authors should follow journal instructions when articles are “in press” or published online ahead of print. Lists of participants other than authors who were allowed to review or comment on the document. We recommend that this documentation is maintained for a period defined by the sponsor company’s retention policy. Articles and presentations following good publication practice will show the characteristics described in table 3⇓. Written agreements using good publication practice will cover, at a minimum, the items described in table 4⇓. The International Society for Medical Publication Professionals initiated the development of these guidelines. The opinions expressed here do not necessarily represent those of the authors’ employers. We thank the consultation panel for their comments. We thank Elizabeth Wager, Sideview, for her work on the original guidelines6 that GPP2 updates (some of the earlier guidance remains in these new guidelines) and for her willingness for ISMPP to sponsor the authors to write GPP2. We thank Sheema Sheikh at Excerpta Medica, Elsevier for compiling comments from the consultation. Contributors: Jane Moore, Medtronic, and John Draper, Peloton Advantage, were members of the steering committee and contributed to discussions about the recommendations made in this document (JD in particular on managed care, pharmacoeconomic, and health outcomes). CG wrote the first and final draft; WPB wrote the draft sections on publication planning, documentation, and conflict of interest; DB, EAF, CSM, and MP contributed to outline, intermediate drafts, and revisions; VBW wrote the draft sections on authors, contributorship, acknowledgments, and medical writers; JMC the draft duplicate publication section, JME the draft review articles section, JAG the draft publication steering committee section, and YEY the draft access to data section. MEM compiled steering committee comments after the consultation, and contributed to outline, intermediate drafts, and revisions. All the authors contributed to the literature analysis and review before writing these guidelines. All the authors contributed to the outline and to the first and subsequent drafts, to interpretation of the comments gathered during the consultation phase, and reviewed the final draft. All the authors approve this document and CG is the guarantor. Funding: The International Society for Medical Publication Professionals provided the contributors with meeting and teleconferencing facilities and web conferencing technology. Competing interests: All authors are members of the International Society for Medical Publication Professionals a not for profit organisation with membership comprising pharmaceutical, biotechnology, and device industries; medical communications agencies; publishers; and independent medical writers. The society is funded by its membership. WPB and JME have stock in Johnson & Johnson; VBW has stock in Novo Nordisk and Parexel; JMC has stock in AstraZeneca; JAG has stock in Wyeth; and MP has stock in Cephalon. CG is a council member of the Committee on Publication Ethics. JAG was an employee of Wyeth, which was acquired by Pfizer in October 2009. VBW was previously employed by Novo Nordisk to work with publications. Angell M. Industry-sponsored clinical research: a broken system. JAMA2008;300:1069-71. Hill KP, Ross JS, Egilman DS, Krumholz HM. The ADVANTAGE seeding trial: a review of internal documents. Ann Intern Med2008;149:251-8. Woloshin S, Schwartz LM, Casella SL, Kennedy AT, Larson RJ. Press releases by academic medical centers: not so academic? Ann Intern Med2009;150:613-8. Wager E, Field EA, Grossman L. Good publication practice for pharmaceutical companies. Curr Med Res Opin2003;19:149-54. World Medical Association. Declaration of Helsinki: ethical principles for medical research involving human subjects, 22 October 2008. www.wma.net/en/30publications/10policies/b3/index.html. International Committee of Medical Journal Editors. Uniform requirements for manuscripts submitted to biomedical journals. www.icmje.org. World Health Organization. International clinical trials registry platform (ICTRP). www.who.int/ictrp/en/. Food and Drug Administration Amendments Act of 2007. www.fda.gov/RegulatoryInformation/Legislation/FederalFoodDrugandCosmeticActFDCAct/SignificantAmendmentstotheFDCAct/FoodandDrugAdministrationAmendmentsActof2007/default.htm. International Federation of Pharmaceutical Manufacturers and Associations, European Federation of Pharmaceutical Industries and Associations, Japan Pharmaceutical Manufacturers Association, Pharmaceutical Research and Manufacturers of America. Joint position on the disclosure of clinical trial information via clinical trial registries and databases. http://clinicaltrials.ifpma.org/fileadmin/files/pdfs/EN/Revised_Joint_Industry_Position_Nov_2008.pdf. Legisalud Argentina. Créase el registro de ensayos clínicos en seres humanos. http://test.e-legis-ar.msal.gov.ar/leisref/public/showAct.php?id=12916. Sociedade Brasileira de Profissionais em Pesquisa Clínica. Legislação Brasileira Secretaria De Vigilância Sanitária E Anvisa. www.sbppc.org.br. South African National Clinical Trial Register. www.sanctr.gov.za/InvestigatorbrnbspInformation/Registrationandregulation/tabid/194/Default.aspx. European Commission. List of fields contained in the ‘EudraCT’ clinical trials database to be made public, in accordance with article 57(2) of regulation (EC) No 726/2004 and its implementing guideline 2008/C168/02.2009. http://ec.europa.eu/enterprise/pharmaceuticals/eudralex/vol-10/2009_02_04_guideline.pdf. EQUATOR Network. Library for health research reporting. www.equator-network.org/resource-centre/library-of-health-research-reporting. World Association of Medical Editors. Policy statements. www.wame.org/resources/policies#authorship. Council of Science Editors. CSE task force on authorship. Draft white paper: solutions.1999. www.councilscienceeditors.org/services/atf_whitepaper.cfm#5. Rennie D, Flanagin A, Yank V. The contributions of authors. JAMA2000;284:89-91. BMJ. Submitting an article to the BMJ. http://resources.bmj.com/bmj/authors/article-submission. Norris R, Bowman A, Fagan JM, Gallagher ER, Geraci AB, Gertel A, et al. 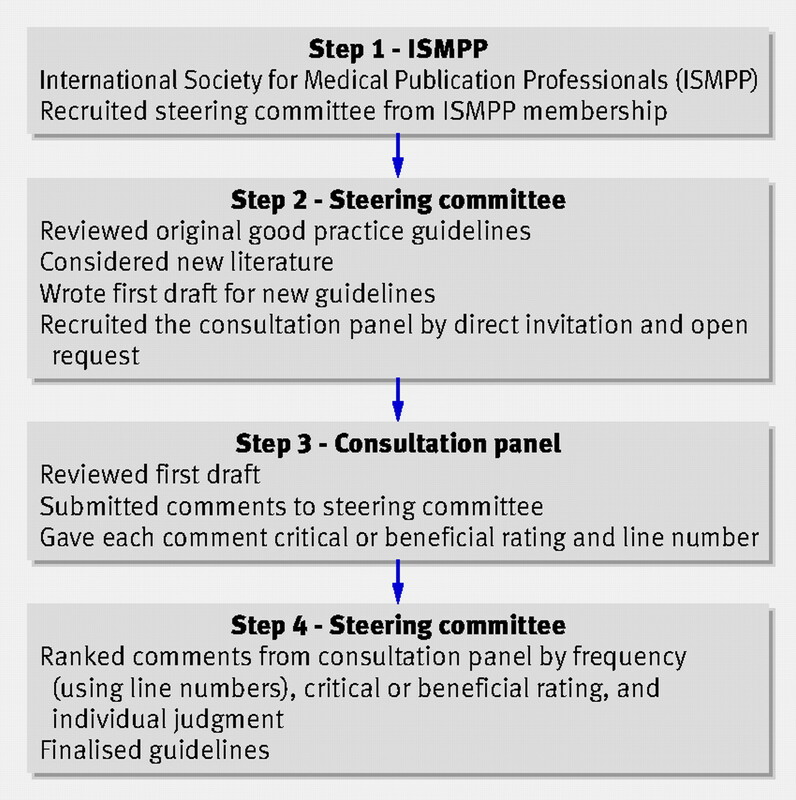 International Society for Medical Publication Professionals (ISMPP) position statement: the role of the professional medical writer. Curr Med Res Opin2007;23:1837-40. Hamilton CW, Royer MG; AMWA 2002 task force on the contributions of medical writers to scientific publications. AMWA position statement on the contributions of medical writers to scientific publications. AMWA Journal2003;18:13-6. Jacobs A, Wager E. EMWA guidelines on the role of medical writers in developing peer-reviewed publications. Curr Med Res Opin2005;21:317-21. Association of American Medical Colleges. Industry funding of medical education. Report of an AAMC task force. 2008. http://services.aamc.org/publications/showfile.cfm?file=version114.pdf&prd_id=232. Lo B, Field MJ, Institute of Medicine. Conflict of interest in medical research, education, and practice. Washington, DC: National Academies Press, 2009. Gøtzsche PC, Kassirer JP, Woolley KL, Wager E, Jacobs A, Gertel A, et al. What should be done to tackle ghostwriting in the medical literature? PLoS Med2009;6(2):e1000023. Stossel TP. Has the hunt for conflicts of interest gone too far? Yes. BMJ2008;336:476. Lee K. Has the hunt for conflicts of interest gone too far? No. BMJ2008;336:477. Drazen JM, van der Weyden MB, Sahni P, Rosenberg J, Marusic A, Laine C, et al. Uniform format for disclosure of competing interests in ICMJE journals. N Engl J Med2009 Oct 13 [Epub ahead of print].